Ratanjot is the Hindi name for a number of plants in the borage family (including Alkanna tinctoria or alkannet) traditionally used for colouring textiles, food (such as rogan josh! ), vegetable oils, wines, medicines, cosmetics and varnishes. It is currently used as a red food colouring agent (E103 or alkannin). The species most commonly used in India (where this plant material came from) is Arnebia nobilis, which is imported from Afghanistan. The purple-brown roots, twisted roots are covered in a papery bark from which the dye is extracted. Dark red, purple and browns are the most typical colours achieved. 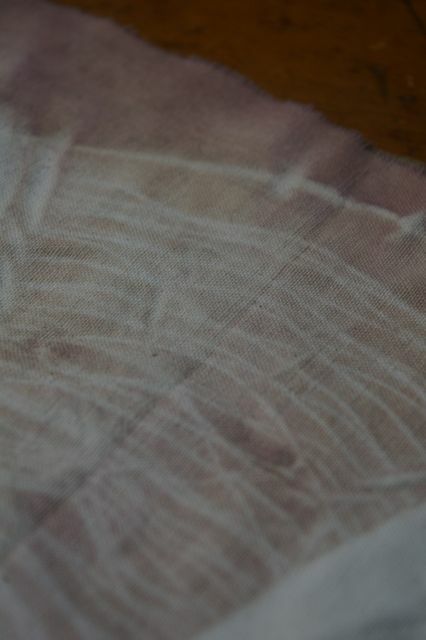 Dyebath 1: powdered ratanjot mixed with alcohol and left for an hour to extract colour. 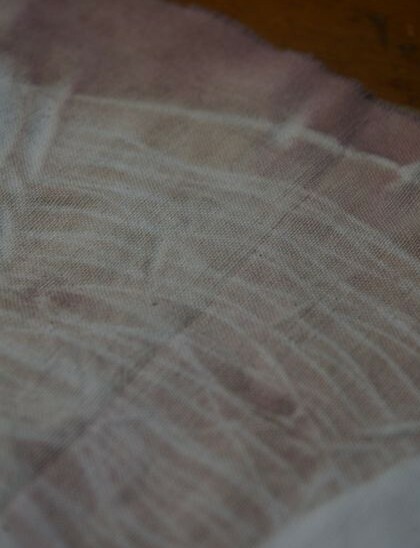 Dyebath 2: powdered ratanjot mixed with cold water to form paste and left overnight. Warm water was then added to both preparations and both were brought to the boil and then down to simmer. Pre-mordanted yarn and fibre were introduced into both baths and left at 80c for approx 1 hour. 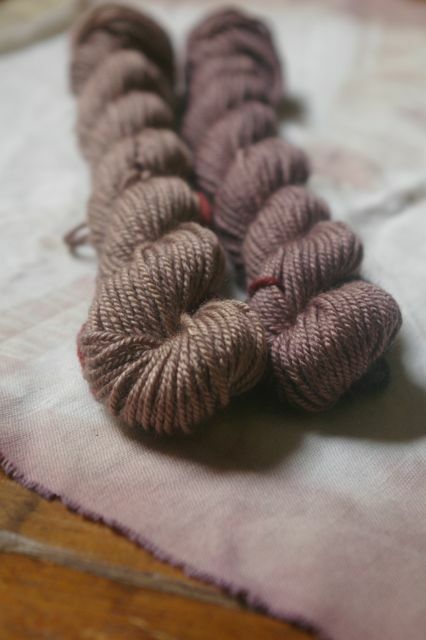 The yarn and fibre in dyebath 1 with alcohol all came out brown, whereas those in dyebath 2 came out soft shades of purple, mauve and aubergine. Ratanjot seems to be light-sensitive; the colours intensified and moved towards purple when the freshly-dyed skeins were exposed to sunlight. Next time, I’d like to see how pH affects the colours achieved; apparently, using an acidic vinegar afterbath results in pinkish shades, whereas and alkaline ammonia afterbath results in greyish blue. 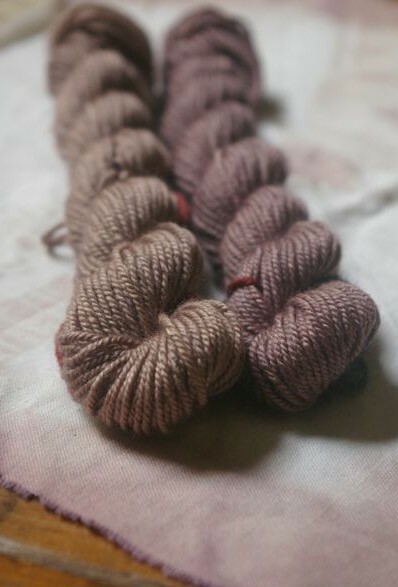 This entry was posted in dyeing, knitting and yarn, plants and tagged dyeing with ratanjot on November 2, 2012 by admin. Interesting! Love that fabric – such a lovely effect. Such subtle colours, so beautiful! I’m not getting much plant dyeing done lately, I need to remedy that. 2. this colour is incredible.